One MP5 magazine is never enough. 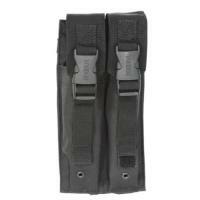 Carry two with the MP5 Double Magazine Pouch from Voodoo Tactical. The full-size carrier features a pair of individual compartments capable of holding two, full-length 30 round MP5 magazines. Engineered for active use, each pouch employs a buckle closure to offer the highest level of retention possible. Regardless if the user is climbing, running or swimming, a quick press of the buckle grants access to stored magazines for rapid deployment. Metal drainage grommets prevent harmful moisture build up to ensure contents function at peak performance regardless of field conditions. The universal strap backing offers secure attachment to belts, vests, drop leg and other webbed platforms.